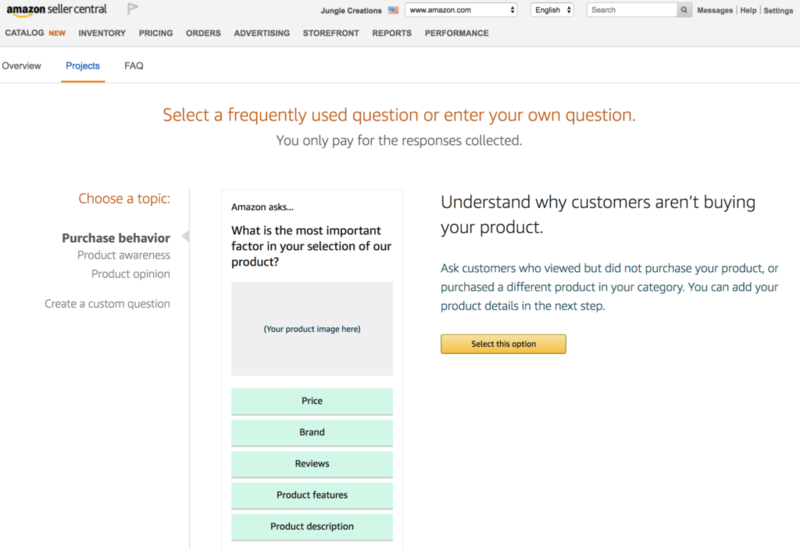 One of the greatest (underused) assets that Amazon offers is reams of FREE customer insights. What used to cost thousands of dollars, and fenced off to only deep-pocketed corporations, is now readily available for any product. Amazing. 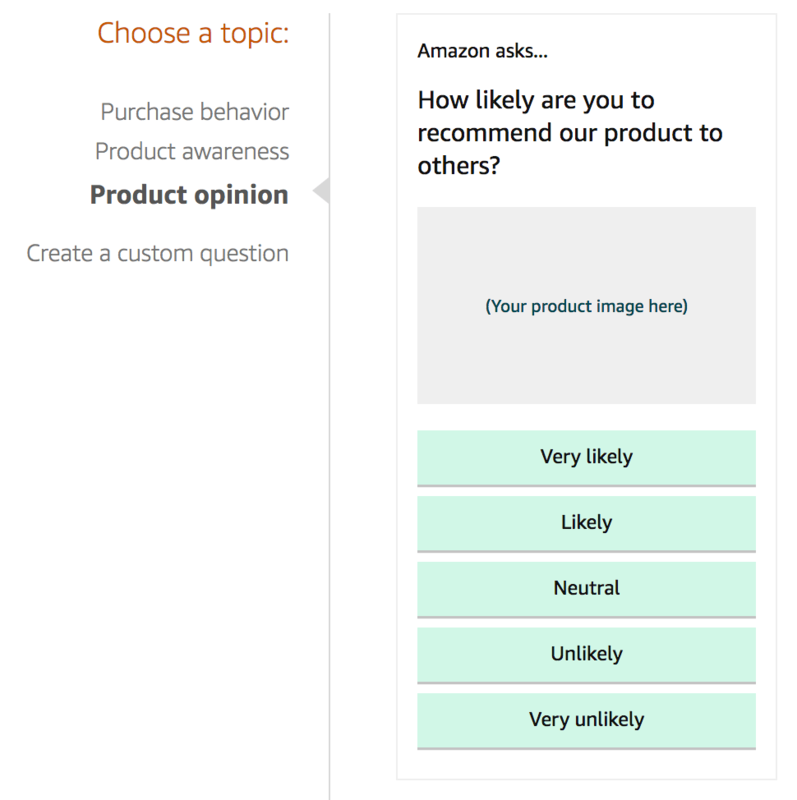 BUT, Amazon just released a really cool new feature that allows you to get direct customer feedback on your product specifically. 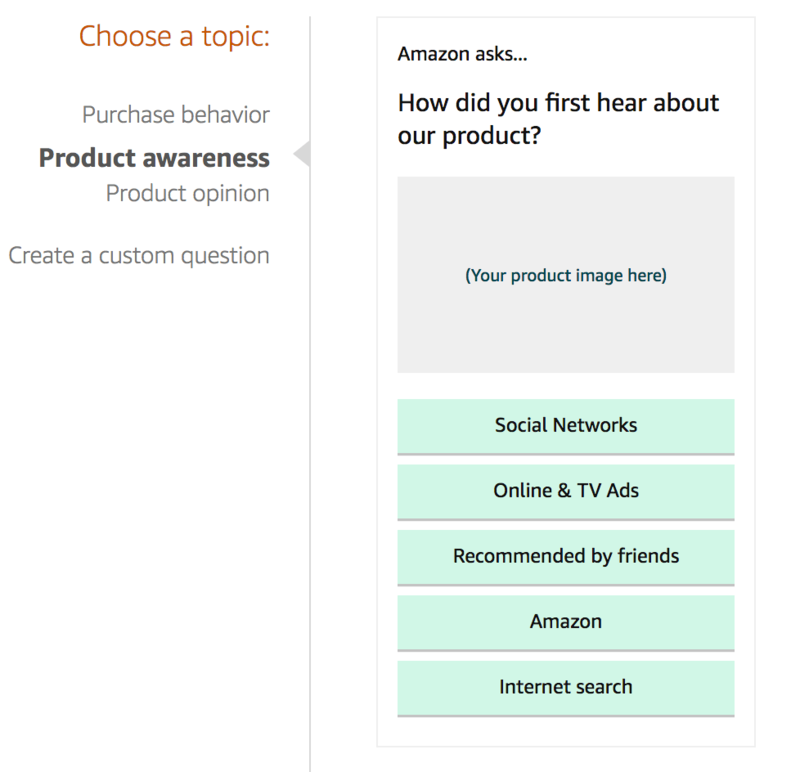 Basically, you can create short surveys that Amazon will present to customers who recently interacted with your product: people who purchased, viewed your product but didn’t purchase, and more. Ultimately, the program allows you to get direct feedback from your target market, with ease and speed. This can be a powerful tool for sellers to iterate and improve on their product marketing quickly, based on quantitative and qualitative data. 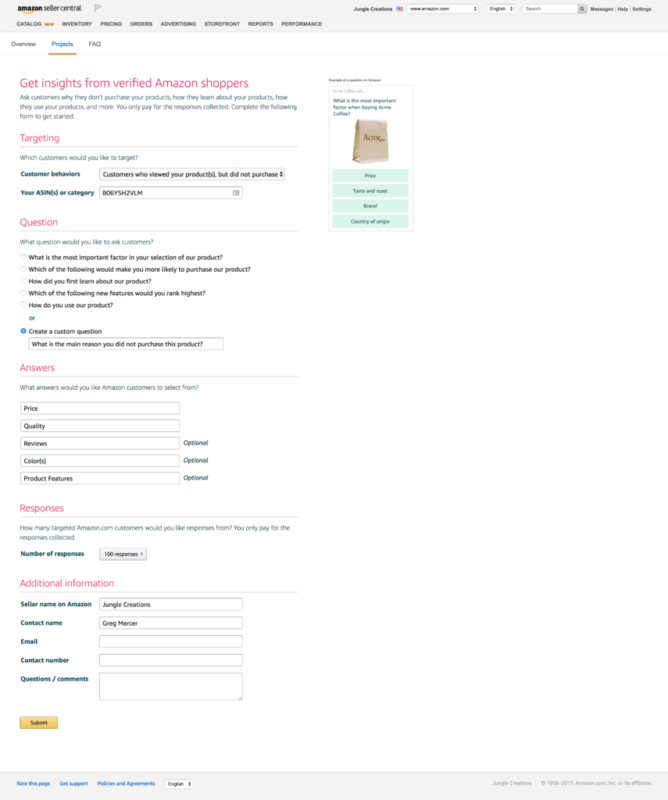 The program is called Amazon Insights, and you won’t be able to find a link in your Seller Central Dashboard. When you create your survey, you determine what your goals are, and who you wish to target. I went through the process of creating my own question and answer options. You can see from the screenshot below that it is very straightforward. The most important thing that I’m sure you’re wondering: how much does this cost? And you may not like the answer: I don’t know. Yet. I have submitted my request to start an Insights campaign, but will hear back in the next 7 days. 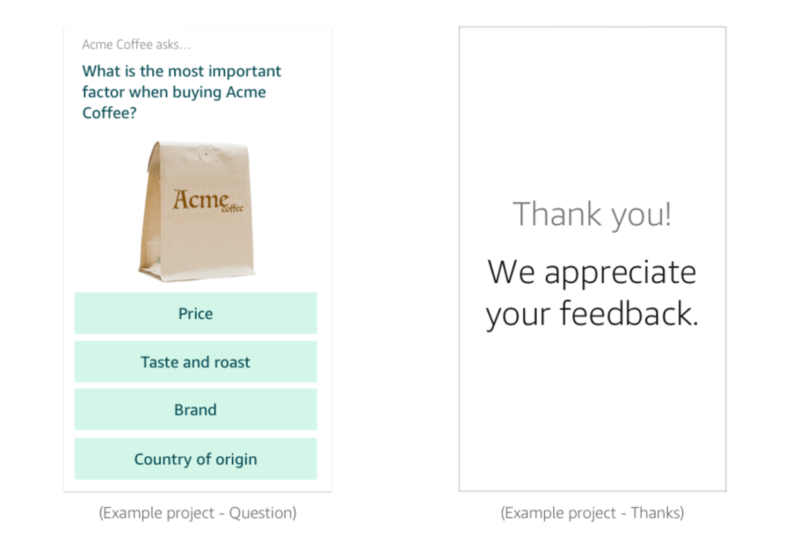 Regardless, you pay per response, and the pricing depends on your targeting criteria and size of segment you target. I will definitely share more once I hear back! You will have to do a minimum of 100 responses at least though, so be ready to make at least some investment into getting these survey answers. I am excited to see how this program unfolds. I think it is actionable and helpful information, if you can learn exactly why someone did NOT purchase your product. So I think that the Purchase Behavior survey will be something that I would be happy investing in. However, I am not sure how helpful the other Insight topics will be. Product Awareness: for private label sellers, I have zero expectation that they have ever heard of my private label brand. Instead, I am banking on the fact that they are simply in need of a solution to their problem, and willing to purchase any good product that appears on Amazon. Remember, this is the main challenge we are addressing in our product research! And as for Product Opinion, I get product reviews to tell me about this. Granted, not every purchasing customer will leave a review, but over time a significant portion will leave a review and help me identify any defective products, packaging, feature, or any other product quality issues. Regardless, I think that gathering competitive data can leave you at a nice advantage over your competitors. Whether it is your Pay Per Click Search Term Report, Jungle Scout Product Tracker data 😉 , or these survey Insights, actionable data that is proprietary to you can give you that competitive edge that ultimately can push you ahead of your competitors! For my active products, I get the majority of my actionable data from Fetcher. It calculates my business metrics so I always know how my products are performing and where I can make improvements. Give it a whirl. Great article. Have you been able to get any cost data yet?